One thing I haven't got around to sorting out yet is the boot lid. I had test fitted it some time ago and it looks ok but I thought it was about time to get it finished. 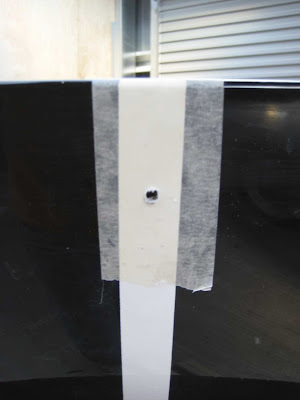 I have read several other blogs and the common practice for fitting the number plate lamp is to thread the wire through the nearside hinge and then drill a hole in the boot lid behind where the hinge attaches and feed the wire through the strengthening rib of the boot lid. Some seem to have more luck with this than others - with some people able to thread form the hinge right the way though to the number plate lamp and others needing an extra hole or two at each corner. 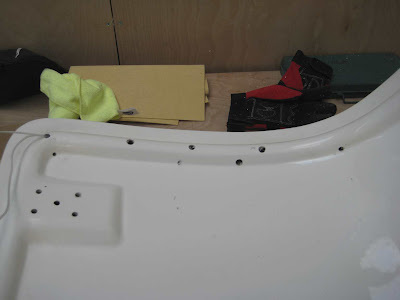 My plan was to feed it through as far as the the hole for the boot latch and then feed back up to the number plate lamp mounting position from there. 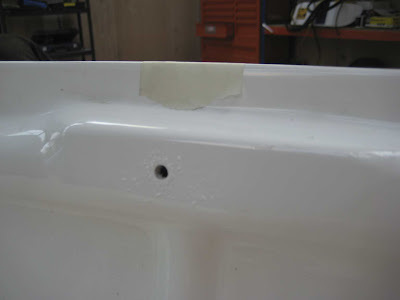 The boot was marked up and the position for the latch established and a hole was drilled. To make matters easier, I followed Ryan's idea and cut the loom close to where the wire passes through the hinge. This would allow me to feed the main wire through with the boot lid off the car and I could later join the two sections using bullet connectors which will be handy if the boot is to be removed again at a later date. My first attempt was to use a length of wire (an old coat hanger straightened out) but this was too rigid and I had no joy. I then borrowed a proper fish wire kit of a friend of mine and thought it would be plain sailing now I had the right equipment - how wrong could I have been. I managed to get the fish wire all the way through but at the last minute (and I still dont really know how it happened) the wire fell backwards between the two skins of the boot lid and got stuck. No matter how hard I tried I could not free it. I left it for a few days and a couple of colleague had a go at freeing it but still no joy so the only thing left was to drill into the strengthening rib and poke something else back in to free it. The photo below shows just how many times I tried without success. Now I have to say this is really embarrassing and I had vowed not to list this on my blog but if the blog is to be a true record of my build progress then it needs to be recorded here!!! Even after all this the offending wire remained well and truly stuck (couldn't even see it) but I managed to get a new fish wire in and pulled the number plate wires through.